In the suburb I am staying in – along with many others like it in South Africa – a fleet of security company cars is ever present, slowly driving around the leafy streets. You can easily spot them as they are covered in their company logos – like those in the Tour de France – only they are not there as back-ups for the cyclists but are there for all and sundry to see, keeping an eye on the comings and goings in the neighborhoods, by monitoring their company’s burglar alarm systems. It is all part of the dedicated armed response service, 24 hours a day; a very visible deterrent against crime. Security is serious business here; it is one of the largest in the world. Every house is alarmed, has automatically locked imposing gates, barbed wired, high fenced walls and burglar bars on all the windows and doors. The security companies also adorn the walls of the houses they service with signs that match those on their armed response cars, letting them (and any potential intruders) know who they are protecting. Dotted around the streets are homely little wooden, sentry-like huts, with protruding CCTV cameras next to them atop long poles, providing bases for the guards. 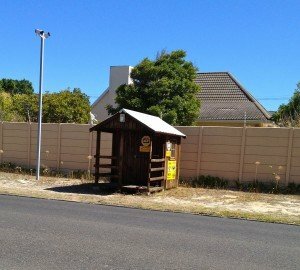 The ultimate in security are the gated communities that offer a 5 star security service, including permanently manned huts. But it is not just about being as safe as houses. As soon as you start to drive your car, it knows, and automatically locks all the doors for you with a resounding and reassuring, orchestrated 4-slam ktchung. And in some of the outside restaurants, you can even find rock-climbing carabiners that have been secured to the underside of each table, repurposed as locks for the diner’s bag. Security is a lucrative industry and it makes the people who live here and the tourists who visit feel safe; white, coloured and black. According to Wikipedia there are over 7000 private security companies employing 400,000 private security officers. That is a lot of eyes on the look out for a country of 49 million people. It is part of the price that was paid, so it seems, for getting rid of apartheid. I was struck the other day by how security can mean quite different things, depending on the word that precedes it. I was having lunch with some architects last week when the topic of ‘food security’ came up. Food and security when combined are very distinct from private and security when conjoined. Instead of being about protecting people from intruders, the term is about enabling everyone at all times to have access to enough food that is affordable, healthy, culturally acceptable, produced in ways that are environmentally sound, socially just, and so on. In other words, it is about opening up rather than locking up. The security is in the food – making it safe to eat. But the real meaning of food security lies in its absence; where the worry is about insecurity in the system, and there not being enough food to go round all year round. And then there is the ‘security blanket’. Both private security and food security are miles apart from the bedraggled piece of cloth children often hold onto for dear life – that gives them much comfort as they navigate their way through an alien adult world.